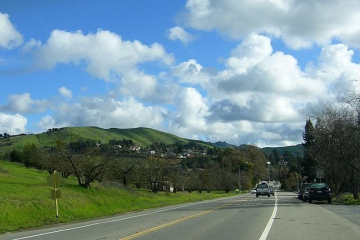 Contra Costa County was one of the original 27 counties of California, created in 1850 at the time of statehood. The county was originally to be called Mt. Diablo County, but the name was changed prior to incorporation as a county. The county’s Spanish language name means opposite coast, because of its location opposite San Francisco, in an easterly direction, on San Francisco Bay. Southern portions of the county’s territory, including all of the bayside portions opposite San Francisco and northern portions of Santa Clara County, were given up to form Alameda County effective March 25, 1853. The establishment of BART, the modernization of Highway 24, and the addition of a third Caldecott Tunnel all served to reinforce the demographic and economic trends in the Diablo area, with cities such as Walnut Creek becoming edge cities. The central county cities have in turn spawned their own suburbs within the county, extending east along the county’s estuarine north shore; with the older development areas of Bay Point and Pittsburg being augmented by extensive development in Antioch, Oakley, and Brentwood.